Thomas Ross was born on 19 August 1866 in Sydney, son of Joseph Ross and Christina Fraser. He married Elizabeth Ann Tye (1865-1953) on 23 January 1895 in Sydney and they had 2 sons. Thomas Ross died on 28 December 1936 at his residence, ’Bottles’ Woolooware Road, Cronulla, aged 71 years and he was buried at Woronora Cemetery. He lived at Bourke Street, Waterloo (1910). Thomas Ross, glass bottle maker, was declared bankrupt in 1897. He was the Manager of the Crown Crystal Glass Co of Sydney in 1936. Ross vigorously advocated a subsidy for the local brass band, stressing the great pleasure residents derived from musical selections played in Waterloo Park. ross was a promoter of the Alexandria-Waterloo Working Men’s Institute opened on 31 August 1908, with its library and other recreational facilities. Thomas Ross was a justice of the peace (JP). He was on the board of the South Sydney Hospital 1909. Thomas Ross was an alderman on Waterloo Council in 1903-13 representing South Ward. 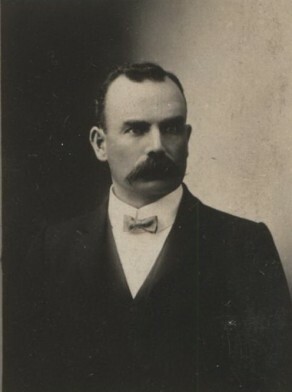 He was mayor in 1908. Barrie Dyster, ‘Ross, Thomas (Tom) (1866–1936)’, Australian Dictionary of Biography, National Centre of Biography, Australian National University, http://adb.anu.edu.au/biography/ross-thomas-tom-13281/text23855, published first in hardcopy 2005, accessed online 24 November 2016.